This entry was posted in Poor Trufan's Almanack and tagged John Hertz, Mark Evanier, Pogo, Walt Kelly by Mike Glyer. Bookmark the permalink. 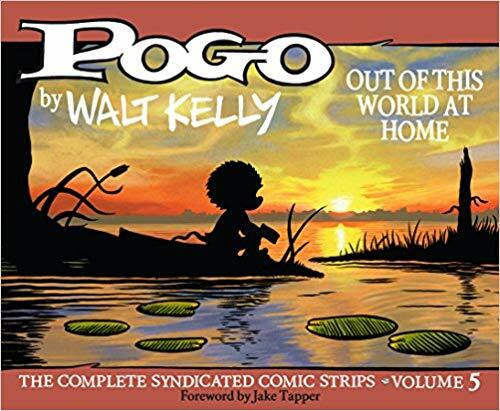 I’m a big Pogo fan myself, but only have the first two volumes and so far have read only the first. It was wonderful! Did Marschall’s review of Pogo mention that it was highly political? It satirized Senator Joseph McCarthy in 1953 when he was at the peak of his power. It is some of the best political satire ever done. “Simple J. Malarkey” is recognizably McCarthy, clearly a menace, and all his schemes are just barely defeated in the funniest possible ways. Walt Kelly’s vision of a swamp where the denizens get along is also political. I was going to say “especially for its time” but look around now. I respectfully suggest that, elemental as this is, it is not the only nor the greatest element. More fundamentally Pogo satirizes, not merely particular fools, but human follies. And it does so bearing in mind Sarcasm is in anger, satire is with love. Nor is satire its greatest element. My own political views are closer to what’s shown in Pogo than in Annie. But there’s a sense in which I don’t care. The spirits of Gray and Kelly might not like my setting aside their politics. Maybe I’ll discuss it with them in Heaven. [If] critics missed … millions of readers, perhaps by instinct, did not … the superb sense of craft that permeated … Annie.... Gray … used his tools as no other cartoonist did…. Annie … intensely personal … revealed the personality of a genius. That’s what I had in mind when I recommended Out of This World at Home. Far be it from me to say that politics is the greatest element in Pogo! Just that it is a well-known element. Although the vision of all the swamp critters living together in their own strange form of harmony is itself political, especially considering its deep folkloric roots.